Vision in Elementary Mathematics by W. W. Sawyer is an unabridged republication of the 1964 Penguin Books edition of the same name. When I began reading this book, I immediately looked for an indication at the beginning of the book that would shed some light on why — after all these years — this book was being reprinted. I found none. However, on the back cover it was written that the book contains methods that have been successful for effective mathematics teachers and is a good read for parents, teachers, or just those readers trying to improve their understanding of elementary [not to be confused with K – 4] mathematics. As further testimonial for Sawyer's books, Fernando Q. Gouvêa states in an e-mail to me dated 20 Apr 2003: "I read two of Sawyer's books when I was young, and they made a lasting impression on me. In one of them, he explained how to understand 2x2 determinants in terms of the area of a fundamental parallelogram. At that point, I don't think I had seen a determinant yet, and when I learned them it was unbelievably helpful to have a concrete visual reference point for what they meant. I've had a soft spot for Sawyer ever since." I was beginning to understand from a pedagogic point of view why Dover Publications reprinted the book in 2003, and as a result, I will restrict my review of the book on its value to both future and present teachers of mathematics. In the introduction, Sawyer offers the example of students learning Chinese characters to illustrate the difference between mathematics "being taught from the outside, as a memory task, rather than an exercise in understanding and insight" (p. 4). He further states that "the whole book is based on the idea of the pupil discovering mathematics for himself ['Himself' of course is intended to cover 'herself'. There seems to be no satisfactory procedure in English for covering boys and girls by a single pronoun]" (p. 6). As a reader, one wants to read further to see how this will be accomplished. The book contains 13 chapters, beginning with chapters on even and odd numbers, divisibility, and ending with chapters on graphs, negative numbers, and fractions. From the first chapter, the reader finds a sense of how the book is structured. For example, diagrams are used to represent both even and odd numbers and to help students discover relationships and make conjectures about even and odd numbers. The author reminds the reader that some diagrams might be more useful than others when representing a mathematical idea to students. He explains, "I had to consider different ways of representing multiplication and see which was most suitable. I am by no means sure I chose the best" (p. 11). Sawyer then applies a slightly modified diagram (reinforced by a chart) to help students understand how to represent any even or odd number algebraically. He is clearly open to using any representation that would support students' understanding of a mathematical idea, looking for patterns and making conjectures. According to Sawyer, students should be allowed to explore their own method(s) even if they are not the most efficient, since through later discussion they may come upon a more effective method. Throughout the first nine chapters, Vision in Elementary Mathematics contains very few minus signs, which is deliberate on Sawyer's part because "more mistakes in algebra are due to a misunderstanding or misuse of minus signs than to any other single cause" (p. 224). Thus, before working with minus signs, Sawyer believes that students need as much experience with the rest of algebra as possible. He hopes that with this approach, algebra will make more sense to students instead of being viewed as a subject teeming with meaningless rules that they have to memorize. Sawyer more or less utilizes the same representations throughout the book as well as easy problems that students can relate to in order to make the transition to algebra from arithmetic more meaningful. Also of interest is the discussion regarding the confusion that arises from the two different uses of plus and minus signs in arithmetic. Readers will also be interested in the comments that Sawyer makes regarding the connection between division and multiplication. These observations also have implications concerning the use of calculators and the memorization of times tables in schools today. The many opportunities for students to make conjectures. Adding and subtracting like terms. Subtracting a negative from a negative. Multiplying a negative by a negative. Simplifying expressions such as 50 - (20 - x). A novel method that illustrates on graph paper which points satisfy an equation. A discussion regarding the language that we use when we say times for numbers greater than one, of for numbers less than one, and the use of the single symbol x for both words. This discussion includes a sequence of whole numbers with alternating blanks where the reader is asked to fill in the blanks. This pattern recognition activity suggests how times and of are closely related. Vision in Elementary Mathematics deals mainly with the beginnings of algebra, but it nonetheless recognizes that understanding arithmetic is important for students to realize that "the pattern of the algebra is exactly like the pattern of the arithmetic" (p. 332). Sawyer adds that if a student "is not clear about algebra, it will only increase his mystification if we try to teach him arithmetic through algebra" (p. 333). For example, the student must first understand how to work with fractions in arithmetic in order to appreciate their connection with fractions in algebra. As mathematics teachers, there are mathematical concepts that we have all wrung our hands over when determining how we can most meaningfully teach them to our students. It is tempting to merely look up how these concepts were handled in Vision in Elementary Mathematics. However, as demonstrated in the book, students might not have the prerequisite understanding in order to appreciate what is being explained. This has implications for not only the teacher seeking teaching ideas, but also for the approach to teaching mathematics by K-12 schools. Sawyer's work subtly implies the need for more consistency and communication by mathematics teachers in how they teach mathematics — which is especially true with the need to build upon students' understanding. Also, students beginning to study algebra need to understand the practical benefits of the subject. As recommended by Sawyer, this can be accomplished by having students begin by solving problems that they can solve, and then later progress to problems that they cannot solve due to the inadequacy of their mathematical background. Students will then have the knowledge and motivation for a more systematic study of mathematics. I am aware that this book is almost 40 years old. Nonetheless, I am impressed with how Sawyer has skillfully used problems that build upon what students know and what he has already developed while incorporating multiple representations and opportunities for students to make conjectures. As a result, it is recommended that the chapters be read in order initially to appreciate Sawyer's fine work. I enjoyed reading Vision in Elementary Mathematics and I found that a lot of the issues then are still relevant today. I am sure that all readers will find that there is at least one useful idea in this book that would prove beneficial for their teaching and/or learning mathematics. 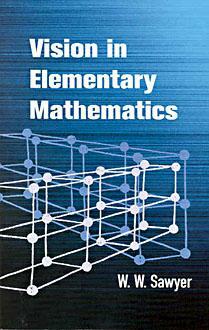 Publication Data: Vision in Elementary Mathematics (second edition), by W. W. Sawyer. Dover, 2003 (original edition 1964). Softcover, 346pp, $14.95. ISBN: 0-486-42555-X. Rick Seaman (Rick.Seaman@uregina.ca) is Associate Professor of Mathematics Education at the University of Regina in Regina, SK, Canada. Read This! is the MAA Online book review column. Contributions are welcome; contact the editor if you'd like to be one of our reviewers. Books for review should be sent to the editor: Fernando Gouvêa, Dept. of Mathematics, Colby College, Waterville, ME 04901. Publishers, please check our reviews information page.